Glitter Bay is a large apartment complex near Holetown that caters to holiday travelers with its comfortable accommodations, large pool, tennis courts, gym, and easy access to the beach. Shak Shak is the only 3-bedroom unit that sits on the ground floor, making it perfect for families, couples, or friends who want quick access to all amenities. The apartment has an open floor plan with spacious bedrooms, indoor/outdoor living and dining areas, a modern kitchen, and a private patio that leads to the landscaped gardens. The beach is just steps away, and restaurants, bars, shops, groceries, and lots more can be found 5 minutes away in exciting Holetown. Situated among the gardens of Glitter Bay, you will find these comfortably appointed one, two, and three bedroom apartment beach front condos which make an ideal holiday home for families, couples, or friends traveling together. 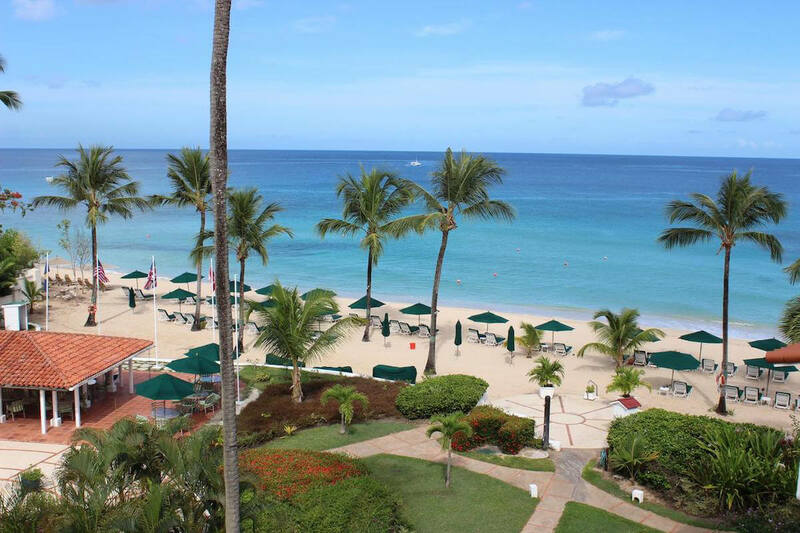 The all-suite property, formerly The Fairmont Glitter Bay Resort, is located on one of the best beaches on the west coast of Barbados and is next door to The Fairmont Royal Pavilion. Glitter Bay Suite 106 “Shak Shak” is a three-bedroom ground floor apartment with approximately 2,000 square feet of living space, which has been recently redone. This is one of the most unique units on the property, as it is the only ground floor apartment with three bedrooms and is one of two apartments that has a gate access directly leading out from the patio to the pool, gardens, and the beach path. The air conditioned master bedroom, with a ceiling fan and an electronic personal safe, is en suite and has a king bed, cherry wood furnishings, and leads out to a spacious patio. There is a TV and DVD player in this room as well, perfect for winding down at the end of the day. The second bedroom has two separate beds, which can be made up to be a king bed if preferred, plus it has a fold-out bed. This bedroom is air conditioned with a ceiling fan for guest comfort. There is also a TV and DVD player here, so it’s a great room for children. The second bathroom in the apartment is located in the hallway. The third bedroom also has two single beds which can be made up to be a king. The third bathroom is in the hallway and is easily accessed by guests staying in this bedroom. The extra large kitchen has granite counter tops, a large sink, a stainless steel fridge/freezer, microwave, dishwasher, electric stove, and oven. The kitchen is fully equipped with glassware, crockery, cookware, cutlery, pots, pans, bakeware and kitchen linens - everything you need for meals and snacks. There’s also a breakfast bar with four high stools, which is great for the children. If you don’t feel like cooking, you can let the nearby patisserie in Holetown prepare your meals and deliver them right to your door. Alternately, being close to so many great restaurants, cafes, and bistros, there is never a problem eating out - the only trouble you may have is deciding which one! The double living area is fully air conditioned and has ceiling fans. One seating area has comfortable rattan furniture, and the TV room has seats and a writing desk. Both of these areas lead out to the very spacious patio. The living room also has an ADSL modem, cable TV, and CD player. The patio has a 6-seater wooden table and chairs and a banquet style seating area with coffee table. This patio also has direct access to the gardens. Off the master bedroom is another cozy patio with two wicker plantation chairs and foot stools, making it the perfect spot for evening drinks or pre-dinner cocktails. Both patios have a great view of the gardens, and even a glimpse of the sea past the colorful flowering shrubs. This apartment is ideal for families; in fact, the owners have 4 children under the age of 12 themselves, so there are lots of play toys and books for little ones. Alternately, it caters to 6 adults just as well!